A couple of weeks ago, the PR machine from Donna Margherita, a popular neighbourhood Italian restaurant sent me an email asking me if I would come and try their food and write about it. I love Italian food and it didn't take me long to accept. "Full disclosure" I said. "Of course" they said. It turns out I haven't been the only blogger to have been invited. In fact Londoneater, Food Stories and Gourmet Chick had all already been and written up their opinions, but the positive reviews had got me hungry. Actually, ravenous. I was cold, wet and grumpy by the time I got to Donna Margherita. The first day of Autumn had well and truly arrived, public transport had almost ground to a halt and the scrum through the umbrellas was on the verge of making me very mad. I was instantly much happier once I got inside Donna Margherita. It was 8pm and it was bustling. Nearly every table was filled and the atmosphere felt "busy" with the gentle hum of conversation and soft lighting. Enrico (one of the Vitale brothers who run the restaurant) met me enthusiastically and we left the food selection in his hands. What a great start! 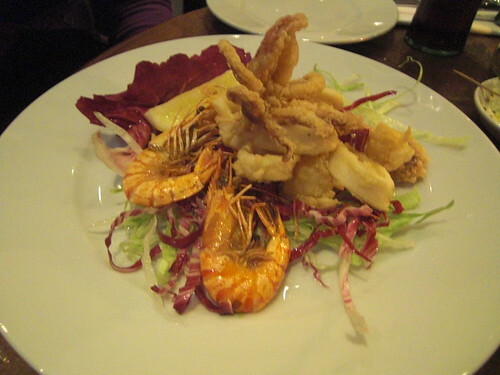 This was a relatively straightforward combination of squid and prawns. The prawns were simply cooked (my sister said they were delicious, I have "issues" with whole prawns) and the squid perfectly fried in a light batter. The batter was crisp and the squid yielding, perfectly done and no sign of any rubberiness. The only slight dud in the meal. Not in terms of flavour, but it was stone cold when it got to our table. If I was paying, it would have gone straight back. However, the flavours were spot on. 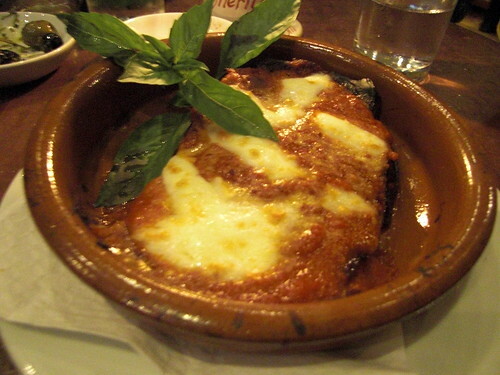 The tomato sauce was absolutely packed with flavour and the aubergine cooked enough so it had just begun to yield. All topped off with gooey, creamy and ultimately delicious mozzarella. A simple dish reliant on great ingredients. ...and joined by bruschetta. No pics for this one, I ate it very quickly. However, two types arrived, one with smoked cheese and friarelli (an Italian green I am told) and one with a simple tomato, garlic, oregano and basil topping. Wasn't so keen on the smoked cheese one, far too many strong flavours but the tomato bruschetta was another example of how all you need is top quality ingredients to maximise flavour. Enrico came over and "educated" us on how to properly eat a Neapolitan pizza. 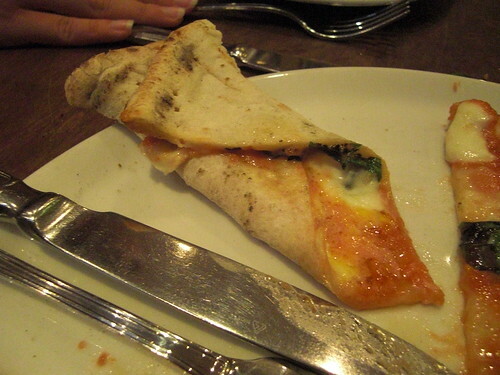 In order to savour all the flavours of the tomato, basil and mozzarella, we were told to fold the pizza so we could get all the flavour in one hit, and wow! The mouthful was a taste sensation to me. The sauce was light and tangy, with that subtle sweetness radiating from the tomatoes. The base was soft and doughy. Mix that together with the smooth and delicious creaminess from that imported Italian mozzarella, and there you have heaven my friends. I have been looking long and hard for THAT pizza to trigger one of my earliest childhood memories. Back when I was a wee toddler in Offenbach, Germany, we had an Italian restaurant at the end of our road which served what I thought was food from the God's. I don't remember many details, other than whenever my parents said we would be going, my little eyes would light up. Ever since that day, I have been looking for the moment that triggered that feeling. Yes, I tried Franco Manca and enjoyed it, but it didn't bring on those memories. This had them gushing back. I was elated. After the pizza came risotto, with Italian sausage and that veg again, friarelli. I was still on that pizza high, and sort of disappointed it was over. 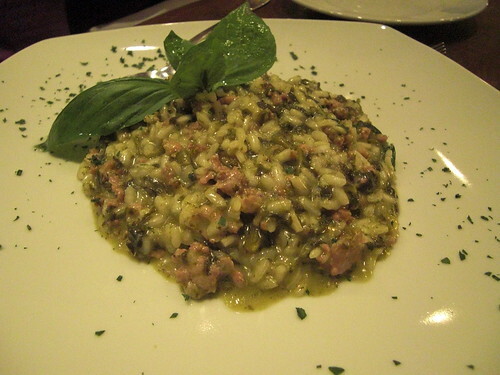 The risotto was also very good, and I really should give it the credit it deserves. Delightfully savoury nuggets of sausage meat intermingled with the slightly bitter friarelli and the rice had the requisite bite. The meal was over. We were offered desserts but we were stuffed and tired. 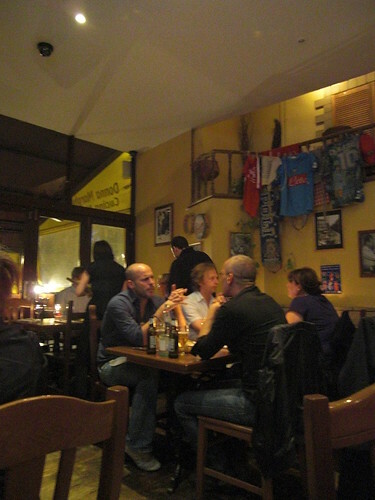 I had really enjoyed myself, the food was great, and we had been showered with attention. One of the questions that came up in a discussion on twitter was what the service would be like had we been paying customers. I made a concerted effort to see how others were treated, but all I saw were happy customers, attentive waiters and Enrico drifting through the dining room, talking to as many people who would listen to him. The feeling I got from Enrico is the immense pride he had for his own product. He spoke passionately of his restaurant whilst constantly qualifying the providence of his ingredients, not defensively, but because he seemed genuinely happy with the end product. He evangelised his products Italian roots wherever he could. I can't say I am an expert, but the flavours speak for themselves. All the food we had was delicious. I may have been one of a legion of bloggers who have been invited, but my opinion was the same as most, great simple and tasty food. On this evidence, their PR machine appears seemingly unneccessary, although, I guess it keeps their name out there. This one may have been a freebie, but I certainly intend on returning and sampling the rest of Enrico and Gabriele's wares. 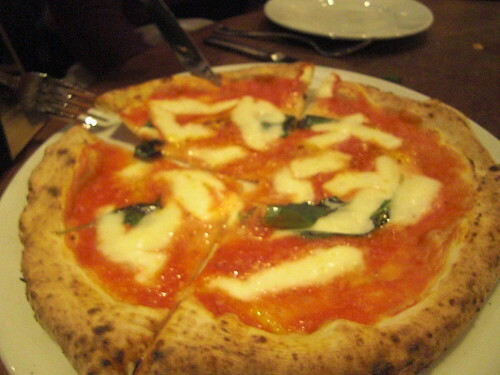 I went to Donna Margherita with Chris as he had had a really bad meal, and was invited back to make up for it. I was really impressed with their pasta dishes, and the margherita was also really good - I might go as far as to say that I enjoyed it more than Franco Manca. Which is a shame, cos it's WELL saaaf west. 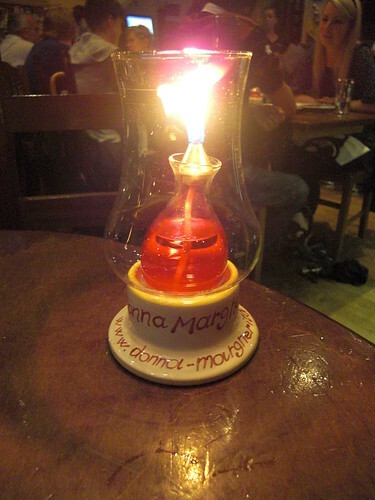 I visited Donna Margherita with friends earlier this year (i.e., anonymously and on my own dime) and was unimpressed. It sounds like when they know you're coming and make an effort, their food is great. But I'd like to think a good restaurant makes that effort for everyone, every time. and infect that is what we do we look after all of our client in the same way bat same time like all the restaurant we have a table that has a bed experiences. 70% of my clientèle is Italian it mast be a reason!! and this get`s as in a very bed position bat i like to give my customer the feeling of been in Naples and to dose people that they have been in naples or in any restaurant in the sauth you realise that same time a table to have is main course can take more then 1 our bat non one makes a complain because they rather to wait 1 ours then getting pre cooked pasta !!!! the rest is always been fine so really i dught the fact that you have bee coming cuple of time and you have never tald as any think so we could not show you that we do care of all our customer!!! !